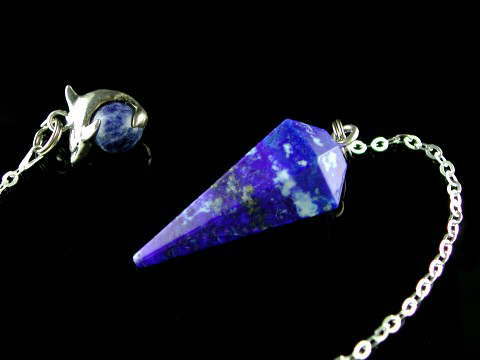 Top quality, A-Grade Lapis Lazuli generator pendulum on a 925 sterling silver chain and finished with a 925 sterling sIlver dolphin 'topper' with Lapis Lazuli bead. The pendulum point is attached via a small barrel clasp, so it's removable, should you wish to wear it as a pendant. Lapis Lazuli is one of the best intuitive or psychic stones, working by activating and stimulating spiritual energy. This makes it an excellent choice for a pendulum. It opens the Third Eye or Brow chakra and when meditated with it can facilitate spiritual journeying. The metallic inclusions in this exquisite stone are Pyrite, make it a protective crystal which shields the user or wearer from negative, low vibration energies; reflecting them back to their source. Lapis is considered one of the most important 'Master' crystals and it was often used by the ancients in ceremonial breastplates of High Priests and Priestess', not only in Egypt, but across Europe. It is also said to increases bonds in friendship and love, making it an ideal gift for a friend or token of affection for a loved one. This pendulum is finished with a sterling silver chain and is topped with a Lapis bead encased by a sterling silver dolphin. Dolphins are magical creatures who represent family, friendship and community, wisdom, compassion and romanctic love. Aphrodite, goddess of love is often pictured with dolphins and one Ancient Greek legend tells of Posiden sending a pod of dolphins to bring him a nymph he had fallen in love with. They were later married and Posiden rewarded the dolphins by immortalising their kind in the stars with their own constallation. Dolphins have also had a long association with man; more specifically as a friend or saviour, with many stories of their having helped sailors in peril who had fallen in the water. These tales can be found in the literature of many civilizations from Byzantiam (modern day Istanbul) to China and Arabia and when dolphins accompany a ship at sea it is said that the crew will find fair weather and following seas, together with safe harbour. Unlike many of the paler, inferior Lapis pendulums available on the market today, this one has superb colour and is of the best quality. It has excellent energy, too.